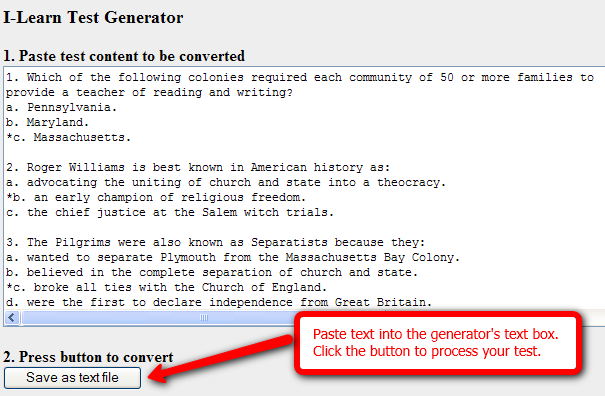 Highlight and copy all the text for the exam and paste into the BYU-Idaho Test Generator, http://www2.byui.edu/ATS/testgen.htm. Save the text file. You may want to change the name of the file as you save it. Take note of the location of the saved file. The file has been saved as a .txt file. If you need to do any further editing, open the file using Notepad. Each multiple choice question begins with MC. Each answer stem is followed by correct or incorrect. Every part of the question is separated by tabs. This is the required Blackboard format for test questions. This text file can now be uploaded directly into Blackboard. Open Blackboard and enter the appropriate course. Go to Control Panel, select Course Tools, and click and click Tests, Surveys, and Pools. Click either Tests or Pools. Click the button Build Test (or Build Pool). Give the Test (Pool) a name. Optional: Enter a description and instructions. On the Test (Pool) Canvas, click Upload Questions. Click Browse and navigate to your .txt file. Set the points per question. Click Submit. At the top of the screen, you will see a green confirmation bar that your questions were uploaded successfully. Your questions will now appear in a Blackboard test (or pool). You can now modify your test (pool) questions as needed. Once you have created your test, please double check each question to make sure the text, correct answers, and settings are correct. It is highly recommended that you actually take each test before giving the test to students.